When would you want to check for NaN? A common example is to check if a value is divisible. In this example, you can't compare it to NaN since that comparison would always fail. if (isDivisible === NaN) // ❌ so this statement would never work since this will always return false because NaN is never equal to NaN. Again, if you try to test NaN in your if statement, it won't work because the condition will always return false. 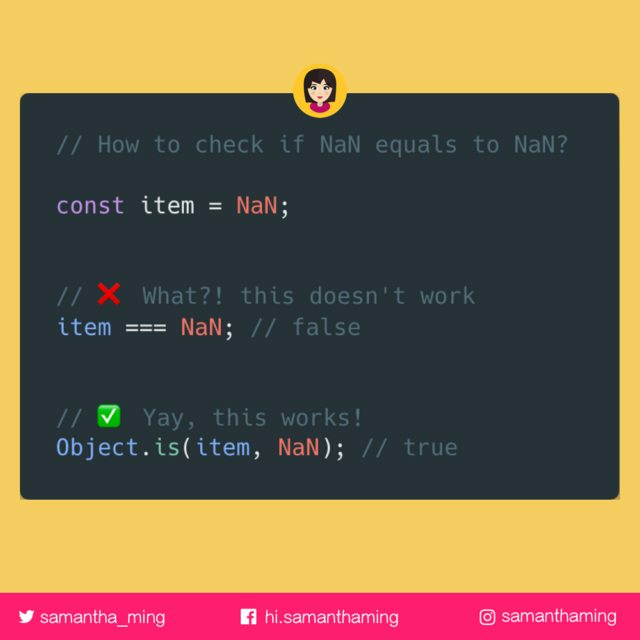 if(hasNumber === NaN) // ❌ again, you won’t be able to use this logic because this will always return false. How about isNaN you ask? isNaN is actually not the best way to check NaN. Kyle Simpson from "You Don't know JS" provided a really good explanation. The isNaN(..) utility has a fatal flaw. It appears it tried to take the meaning of NaN ("Not a Number") too literally -- that its job is basically: "test if the thing passed in is either not a number or is a number." But that's not quite accurate. window.isNaN( b ); // true -- ouch! Clearly, "foo" is literally not a number, but it's definitely not the NaN value either! This bug has been in JS since the very beginning (over 19 years of ouch). Alternatively you can also use Number.isNaN to check. [email protected]eyalPerry: I think that Number.isNaN is better suited for this use, as it does not incur the overhead of checking the parameters against various types and their edge cases. For those curious about the "why" of this. Here's a medium post explaining why NaN is not equal to NaN. Short Story: According to IEEE 754 specifications any operation performed on NaN values should yield a false value or should raise an error. Thanks CJ J for sharing this. TL;DR is "Because the IEEE standard says so".